Since December 2008, the rolling 12-month total consumption of natural gas by the electric power sector has consistently exceeded the same measure of natural gas consumption by the industrial sector. Both the decreased industrial natural gas consumption due to the economic downturn and the increased utilization of natural gas-fired electric power generators contributed to this change. 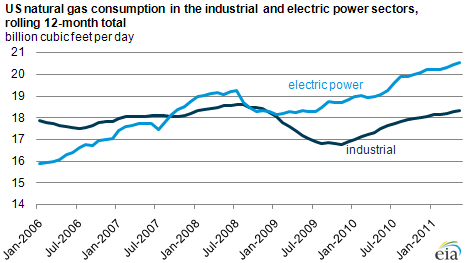 Annual natural gas use for power topped industrial natural gas for the first time in 2007. The general trend for the rolling 12-month total of U.S. electric power generation is similar to the trend in industrial natural gas consumption. In August 2008, natural gas consumption in the electric power and industrial sectors, as well as total U.S. electric power generation, all fell. However, natural gas use for power rebounded starting in February 2009—much sooner than both total U.S. electric power generation and industrial natural gas consumption, which both started recovering later in 2009.